In order to attend the Williamsport HOG Chapter’s annual River Rat Poker Run we have to make a common choice: take the highway and get there fast, or take our time and enjoy the backroads. Since I’m married to a lady rider and First State HOG® Road Captain who knows how to connect those backroads along the Maryland Pennsylvania border the choice is easy! I’ll follow the Mrs and take the twisted country roads through meandering hills and rolling farms. I’ll enjoy the ride and arrive in Hagerstown, Maryland in time to enjoy a fun dining experience at Barefoot Bernie’s and grab a few drinks with my friends at the Cancun Cantina West. Maybe I’ll take a dip in the pool at the Clarion Motel before calling it a night. This is the second year Diana has made this a First State Chapter trip and we have dubbed it the Smell The Flowers Ride because we know you can get there and back in a day but we would rather “take the time to smell the flowers” as they say! Since this is a Maryland trip we really call it the Smell the Black-eyed Susans Ride but our Delaware friends don’t get the connection. 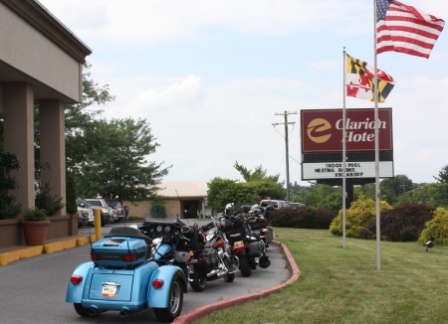 If your heading west through Maryland I recommend staying at the Clarion and enjoying the experience at Barefoot Bernies and the Cancun Cantina West. All three buildings are attached making it a great destination since you can have some serious fun once the kick stands are down for the evening. There is usually a big biker bash the same day as the Williamsport HOG® River Rat Poker Run and maybe that’s more your speed. My speed is get back on those backroads in the morning and enjoy a guided HOG® poker run through historic battle grounds. I have enjoyed being the Director of First State Chapter for 2009, 2010 and 2011. As Director I formed a board of officers who work together as a team to make decisions that affect the chapter. Putting together the right people doesn’t happen overnight but in the end a close knit group of dependable trustworthy leaders who put the needs of the group before their own is key to a successful organization. Most of the lessons I have learned have been from mistakes and thankfully I figured out this team approach before making any huge mistakes. However I did learn through mistakes to carry this team approach further than I had originally anticipated. In my first year as Director I made several decisions on my own without consulting with the other officers. The good decisions were of course a non issue such as investing money in a new PA system. I made some bad decisions. The bad decisions could have been avoided had I consulted with my team mates. An example of a bad decision is appointing someone to a leadership position without getting to know them first. Through a little trial and error I learned that working together as a team works better than a dictatorship. Not only do you benefit from the input of your most trusted associates, you relieve any one person from having to shoulder the burden of unpopular decisions. There have been several occasions where I brought an action before my team and the team decided to go in a different direction than I wanted. This experience of putting my ego aside and deferring to my colleagues even when I wanted to lay down the law has been one of the most valuable lessons I have learned. There were many times when I wanted to say “we are going to do it this way because I am the Director.” By putting my ego aside, treating all the chapter officers as peers and working together as a team we have succeeded at everything we set out to do. H.O. G. membership has many benefits and one of the most popular is H.O.G. state rallies. State rallies are gatherings for H.O.G. members to get together, ride and have fun. You can: attend rallies, volunteer at rallies and even organize rallies. You can attend a H.O.G. rally in your home state or travel to an out of state rally. By attending out of state rallies you will meet new and interesting riding companions. You will also be introduced to a variety of new roads and adventures (new foods and restaurants too!). Attending your local state rally is a good way to form friendships among members of all the H.O.G. chapters in your state. You’ll find that there are many more like minded fun loving H.O.G. members in your neighboring chapters who love to ride and have a good time just like you. You can attend state rallies and even better yet, you can get involved as a volunteer! Nothing makes an event more enjoyable than contributing to its success! As the 2010 Delaware/Maryland State H.O.G. Rally Volunteer Coordinator I had the pleasure of meeting and working with many H.O.G. members that I usually don’t see often or who I had never met before. It was a great experience for me and the volunteers. Every volunteer had a good time pitching in to make the rally fun and I had a great time working with everyone and making new friends. State rallies are completely a volunteer effort and organized by fellow H.O.G. members. Your assistance as a volunteer is always appreciated but don’t rule out the possibility of planning and organizing a future rally. I recommend you contact Beth and see what you can do to help out at the upcoming rally in Salisbury. You should also take a look at the other 2011 H.O.G. Rallies and set a course for an out of state adventure! In the time I have been writing this blog I have been promoted from Activities Officer to Assistant Director and then to Director of my HOG Chapter. My Directorship will be ending this year and my new challenge will be…. drum roll please ……..
As of this evening I am officially the 2012 Site Coordinator for the MD/DE State HOG Rally! The rally will be on Father’s Day Weekend in 2012 at Deep Creek Lake, Maryland. It would be totally awesome if any/all of my Internet blogging friends from out of state could support me in this effort and come out here for the best riding Maryland has to offer. Diana is the Volunteer Coordinator. I am sure we can count on all you local HOGs reading this to help out. Congrats to 2012 Rally Coordinator, John Hardison, for putting together the rally proposal and letting me and Diana work with him on this project. Looking forward to it!